Slowly, cautiously and with alot of personal courage Baghdad is coming alive with commerce, new business growth, and nightlife. 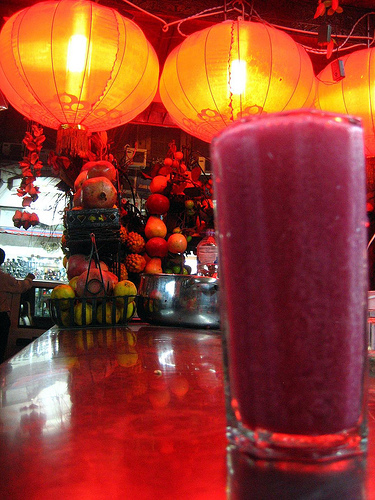 Suddenly, several visitors to this once besiged city witenssed the innovation of Juice Bars which grew form carts and traveling vans. Moreover, coffee houses are likewise appearing in spots which just weeks previous were burned out hubbles. Some of the population thought they were seeing a mirage and when these new businesses started to be open at night and they became an oasis of generator-driven light beacons towards a prosperous Baghdad nightlife future. According to one report. " a colourful jumble of trendy juice bars, cosy restaurants, fruit shops, roadside eateries and fish vendors, where children play, families dine and lovers meet." "Even two or three months ago we would have been afraid to come here at night," said 20-year-old Hussein Salah, an off-duty soldier, slurping a milkshake with his wife, Shihad, at the Mishmesha (apricot) juice bar in Baghdad's relatively safe Karrada suburb." Additional reports from American Military soldier blogs additional opennings are being assisted by voluntary patrols of local citizens closely watching each venue with positive expectation that nothing will happen. " There is alot of pined up expectations, and people really want to live their lives and find their future love ones," according to a translator who just interviewed a customer at an Ice Cream stand along with her children. Everyone one now is feeling the emerging energy and as s result creating more voluntary patrols --- who are mostly armed with rocks and bricks ---- by locals who do not want to see tthis stoped for any reason. Thus there is an optimism and staying open to 2:00 AM is not unheard of..
A side note: Iraqi Business sectors are growing! Unknown to most Non - Arabs there has always been a form of Arab - Centric Democracy which has been largely free - market private sector based and of which has been primarily practiced, and to a very large extent protected by whose ever in political power, in the open market places where goods and agricultural products were being sold. A communal form of haggling ( pricing democracy - Where market prices, though in Urban centers have been semi - established, the market systems to established them as being fixed are both foreign and dangerous to most Arabs who are living on the economic margins - the Arab working poor. ) is the present Arab - acknowledged basis of Arab centric democratic behaviorisms within the private sector Arab civilization. In the present democratic process to establish the rule of law - which every Iraqi who is attempting to provide for the future of ' his ' family firmly desires now are commiting themselves to re - invest themselves into this process politically. An Arabic, with Iraqi ethnological twists, form of Cultural Democracies [ Note the Plural! ] are now in the haggling stages nationwide through out Iraq. At the core of the present effort at both local and state - wide stability is the ethnological reestablishment of Arab - Family - Centric Values which now centers on those working traditionals, and their moden adaptations in finding a bride, or bridal selection. To established the power base of Networking family relationships and coalitions with other family networks through marriages. Though the stains of Saddam's former regime at times successful attempts to corrupt this process, especially in how various agents were recruited from sexual diviants of Iraq, this process is now assuming more and more of its primary Arab - Centric value systems which existed previous to Saddam's regime. It is these two primary components which both America and Europe should show complete defference to, adpat cautiously. and start to ally itself with first and foremost. Anotherwords, start giving wedding gifts to important and sociopolitical significant marriage couples on Local, State, and International levels [ an Iraqi marrying a Saudian Arabian ], especially the bridal gifts.. Moreover, attention must be drawn to locate previous agents which worked against such values during the Saddam;s regime. There has been growing suspicion, by Iraqi exiles - especially Iraqi middle class wifes, who are / were living in other Arab urban centers talking to other Arab wifes of the host Arab State, " That after the collapse of Saddam's regime these very same agents singularly worked to establish their former powers by allying themselves to those who were against the rule of law power - to escape attention and focus upon the various forms of their own sexual diviant behaviorisms." Their prime targets of their sexual diviant aggressions were to create fear and thus enforced respect to their persons by their attacks and murdering mixed Sunni - Shiite Arab couples. Why? The singularity of the Arab marriage covanant - Arab family networking traditions of coalition building is crucial to Iraqi secutiy and as an additional sociopolitical component to bring about Iraqi stability with its Arab neighbors and Upper Class Private Business structures. An Iraqi female marrying a major business leader from Dubai for example. Right now every Iraqi knows the importance of the rule of law and this means Arab law of Iraqi traditions [ note the plural ], and that such codifications in the processes to bring them about are now being implemented by the due process of Arab - Centric haggling - where political points must not be fixed prepositings. That additional social focus on providing for the assured social success of the Arab Centric values of the centrality of the Arab family, along with its birdal selection processes are key points in all future governmental social programs first and foremost as well as keeping the lights on. Though a centain degree of the Institutions neutral academic position in all of this, none the less, the full hearted Arab - Centric value of assuring top level educational programs for their children is Baghdad University's single national importance, Presently depleated of its top sudents who are studying at other Foreign Universities needs to be immediately resolve. The Child of Iraq - will benefit Baghdad University, and as such lasting American interest in the State of Iraq should be supported and implemented by most American students / scholars to participate by directly assisting its institutional academic excellence goals - what ever they decide. These elements are now the furture of Iraq. 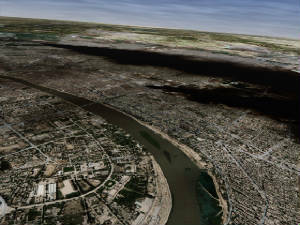 Welcome to the future of Baghdad, Iraq. One of several first steps. Baghdad, Night Life ( NightLife ), RMC. This is an Inter - City Cultural Communication website program between the cities of Baghdad, Iraq, and Ithaca, New York. It is the first attempt to promote two very different locations to confir on a positive agenda for future prosperity. Thus this site is cleaned of all hints of politicalization ( promotion of one group over another ). This is to allow clear lines of cultural communications to occur at the sametime. This is a part of Operation Proud to Serve, in which there are four primary links. All American Dance Troupe of the 377th V.V.A. Tri Falcon and Dove Producations. As this site develops, these links will be deleted in favor for Baghdad citizen entertainment related web sites. As the cultural democratic character of Night Life ( NightLife ), RMC further develops, this site will under go conversion to Iraqi private sector concerns and promotions, especially with regards to entertainment. For security Night Life ( NightLife ), RMC in Baghdad is private and family based. Public options and entertainment value and venue openings are presently dangerous. Promotions are held sequestered-cloistered. 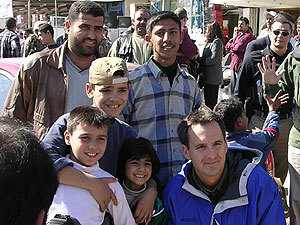 The leading use of the InterNet is to provide clear channels in which the ethical applications of human behavior can be greater impacted by International InterCultural Communications - which in its dynamics triggers greater field of personal discoveries - thereby creating additional global behavior of conflict preventionings. This is the central cultural and commercial scope of this company. Iraq itself: At present I have been notified by refugees living in Arab urban centers, IE. such as Cairo, that nutritional crises have occur triggering the reappearance of TB and other health related issues. Saddly too, Iraqi women are having difficulties in producing milk for their own children. That in many areas most communities are looking for greater autonomy as a resolution to their present difficulties. The value of trust of outsiders is still great and in cenrtain areas growing. None - the - less, the business - private sector now must evolve. in as much as the need to deal with these crises can be largely offset by business transactions more than by the present poltical behaiorism in Iraq is caught up in. It is in real historical sense there is an Arab logic and ethical persuasion in which the Arab - not Iraqi - business cultures in the past likewise promoted conflict preventionings. The truer sense of national unification in the Arab world is soldified by the business sector according to local and regional sociocultural customs. Thus there is a connection -BUSINESS! Everything which being tried here in Ithaca, New York is similar of what is also happening in Baghdad, Iraq. Moreover, the critical juncture of Cultural Communication occurs in the producing of social and cultural events. What this website, along with the cultural democracy formula associated with it, allows the average community online users to have imput on its content. This has been discovered from similar approaches from Tokyo, Japan, all the way to Los Angeles, California, as well as from New York City to Paris, France. Some 39 Night Life ( NightLife ), RMC cities, along with 64 supporting blogs. The inclusions of blogs are highly imprtant. For they are developed by those who really do not want to develop a whole website to get others to know of who they are, or what their interest is. 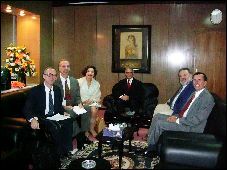 The members of the Library of Congress team who visited Baghdad in October-November 2003 to advise the Ministry of Culture on the National Library of Baghdad, wish to thank all those who made the mission possible. Their special thanks go to the Minister of Culture Mufid al-Jazaeri for his support of the mission, to Ambassador Mario Bondioli-Osio who guided and advised them and listened to their reports every day the mission was in Baghdad, to Professor John Russell who was among the very first people to visit the National library after the war, and whose opinions the members of the LC team valued highly, and to Kristen Jenkinson-McDermott without whose help and planning the team would not have been able to accomplish their work. The team is also extremely grateful to Wishyar Mohamed, the CPA advisor on libraries, who was always sharing his views with the team and enabling each party to better understand the concerns of the others. Dr. Faiza Adeed was inspiring as a woman with a vision for her country and for a great library for the future of Iraq, and we are grateful for her help and that of Acting Director General Kamil Jawad who explained to us at length the problems of his library. The LC team wishes to express its gratitude to all the staff of the National Library and to that of the House of Manuscripts as well. The team was very impressed by the dedication of the librarians and the staff members of those institutions and of the way they defended and protected their books and manuscripts, and in so doing protected the cultural heritage of Iraq. Dr. Dhamia `Abbas Samarai the director of the House of Manuscripts and her husband the former director Usama al-Naqshabandi must be praised for the important work they did there over many years. Thanks must also go to Wathiq (Tony) Hindu for his efforts at rescuing the flooded documents, and his assistance to the members of the team throughout their stay in Baghdad. The team also wishes to express their thanks to Maria Kouroupas and Bonnie Gardiner of the Cultural Property Office of the Department of State who believed in the Library of Congress' mission to assist the National Library in Baghdad, and provided the moral and financial support for the team to do so. They are also grateful to the Coalition Provisional Authority Representative Office in Washington who took care of their trip to and from Baghdad. Thanks go also to Dr. James Billington, the Librarian of Congress, Jo Ann Jenkins, the Chief of Staff, Deanna Marcum, Carolyn Brown, Nancy Davenport, Beverly Gray, Marc Roosa, Diane Van Der Reyden, who supported and encouraged the team every step of the way. A team of three specialists from the Library of Congress led by Mary-Jane Deeb, Ph.D., Arab World Area Specialist, and including Michael Albin, Chief Anglo-American Acquisitions, and Alan Haley, Senior Conservation Specialist, left for Baghdad on Saturday, October 25th . They arrived in Kuwait first, and spent the night of Sunday, October 26th at the Federal Deployment Center of the CPA located at the Hilton Resort in Mangaf. On Monday October 27, they flew to Baghdad where they were met by Kristen Jenkinson-McDermott, Program Analyst at the Educational and Cultural Affairs Office of the US Department of State and the CPA Coordinator for the Cultural Property program in Iraq. They met with Professor John Russell, who is the CPA Senior Advisor on libraries and museums, and Ambassador Mario Bandioli-Osio who is the CPA administrator for libraries and museums. On Tuesday, October 28, the members of the LC team were given a tour of the "Palace", met with military personnel involved with the Iraqi Ministry of Culture, and were briefed on their mission by Kristen Jenkinson-McDermott, John Russell and Ambassador Bandioli-Osio. That evening they met with Wathiq (Tony) Hindu, an Iraqi contractor for the CPA and the person who had arranged for lodging, car and security for the LC team. Each day after the team members visited sites they returned to the Palace to brief Ambassador Bandiolo-Osio and sometimes members of the military as well as to their activities that day. The next morning, Wednesday, October 29, the members of the LC team visited the site of the National Library of Iraq, the "Old Library", as the team called it to differentiate it from the site for the "new library" selected to replace the damaged building. 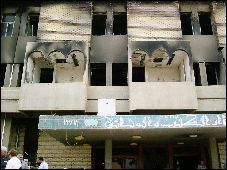 The team spent the first couple of hours visiting the ground floor and the two floors of above the entrance the building that had been burnt by two fires on April 10 and 14, 2003. The team also visited the stacks of the national library. The stacks had been closed and the entrance, a large and heavy metal door, had been welded shut after the two fires and lootings that occurred in April. The door was opened, on October 28, for the first time since the April fires, so that the LC team members could visit and see for themselves what had happened to the collections. The team was thus the first non-Iraqi group to view the collection first hand, and it was able to visit each of the five floors and see for itself what was in the stacks. The team also took photographs of the collections. The team members then met with the staff. Deeb and Albin sat down with the librarians present and held discussions with them in Arabic, identifying their names, their field of specialization and what academic degrees they held. They also talked with the heads of departments and found out more about what had happened to the national library, and what the librarians thought of having a new library in the former "Officers' Club" located a few blocks away. They met with Acting Library Director General Kamil Jawad and Library Director General designee Faiza Adeeb and got their views on the current plight of the library and their aspirations for the future. Professor Nazir Qasim joined the library discussion. He used to be director general of the National Library in the late 1970s and early 1980s, and taught library science to many of the current staff members of the Library, including to the Director General designee Faiza Adeeb. The LC team also met with Wishyar Mohamed an Iraqi expatriate and library specialist, who is the CPA Advisor for the reconstruction of the national library, and who, throughout the visit, coordinated the activities of the LC team with those of the Iraqi librarians. 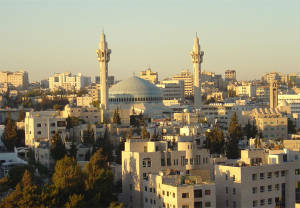 Two religious clerics, Al-Sayyid 'Abd al-Mu'in al-Musawi and Al-Shaykh Muhammad Jawad al-Tamimi, then joined the group. They were members of the Hawza or Shiite clergy who had taken part of the library and archive collection to their mosque for safekeeping after the first fire and before the second (between April 10 and 14). The discussion with them proceeded while their staff were bringing back some of the books and documents that they had stored in Sadr City in another part of Baghdad. 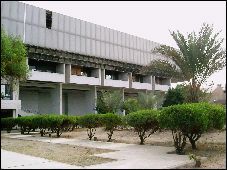 Two architects/engineers, Mazen Hasan Ridha, Director General of the Private Projects Directorate at the Ministry of Housing and Construction, and his assistant Zafir 'Abd al-Jabbar also came to the meeting and expressed the view that the library should not be moved to the Officers' Club, and that the damaged library was architecturally sound and could be repaired. The following morning, Thursday October 30th , Kristen Jenkinson and John Russell escorted the LC team to the site where the old manuscripts, once housed in "Dar Saddam lil-Makhtutat", had been hidden to protect them from looting. The primary location was bomb shelter No. 12, in the Yarmouk district of Baghdad (although some of the manuscript cases and the microfilms of the manuscripts are stored elsewhere). The team met there with the head of Dar al-Makhtutat or "House of Manuscripts" Dr. Dhamia 'Abbas Samarai, and her retired husband and former director of that institution, Usama al-Naqshabandi who has published several books on the Iraqi manuscript collection. They showed the team metal cases in which 50,000 manuscripts were stored, and the small laboratory where specialists in preservation and conservation were working to repair damaged manuscripts. The LC team observed what was being done, looked at and photographed manuscripts and talked with the curators. They also met with neighbors and others in the area who were looking after the manuscripts. 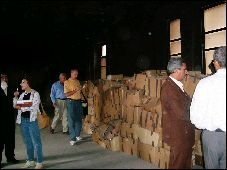 After lunch, the LC team went to visit the site where water-damaged archival documents and rare books had been stored. These materials had been found at the Board of Tourism Building where they been brought at the beginning of the war for safekeeping. Later that storage area had been flooded and Tony Hindu had been asked by the US military to get the flooded materials out of the water, which he did. Those materials were then placed in a three room apartment in an inhabited building to dry. We surveyed the apartment, photographed the rooms and some of the documents, and talked to the librarians who had been responsible for moving these documents from the library to the board of tourism. On Friday, October 31st , the team accompanied by Kristen Jenkinson, John Russell, Wishyar Mohamed, Faiza Adeeb and Kamal Jawad visited the Officers' Club, which had been selected by the CPA as a possible site for the new national library. The team was given a thorough tour of the premises by a military engineer, Specialist Paul Drake, the Facility Maintenance Coordinator. Drake not only had made a thorough inventory of all the building's infrastructural problems, he had also prepared a report on what needed to be done, and had developed plans to build stacks if those were to be recommended for a new national library. 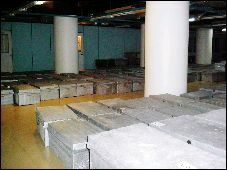 The LC team also visited the North Garage of the Officers' Club that had been repaired by Iraqi engineers hired by the CPA, to assess the feasibility of using it as a temporary storage for the collections of the National Library. The team also visited the officers' library located in an adjacent building to the club to decide whether these facilities could be used for storage. That evening the team stayed in the hotel. Ambassador Bondioli-Osio dropped by unexpectedly to let them know about threats of attacks on US forces the next day, and a possible strike in Baghdad. He mentioned that some planned visits might have to be curtailed or even canceled. On Saturday, November 1st , the team members decided not to take any risks, and instead of visiting the museum as had been planned or the religious awqaf center in Sadr city, they returned to the Old Library with John Russell who had not visited it with the team the first time around. They were all able thus to confirm what they had seen and what it meant and take more photographs. They also observed the return of the materials taken by the Hawza at the time of the April fires which were boxed in cardboard boxes and returned for storage to the Old Library. Sunday, November 2nd , was the day when all the visits would come to fruition. In the morning the team was invited to the "House of Fashion" the restored building which is planned to become the new Ministry of Culture. The members of the LC had been asked to address the Library Board Representatives, and others including the engineers of the Housing and Construction Board, as well as the new Minister of Culture Mufid al Jaza'iri, and Ambassador Bondioli-Osio. Each team member had prepared a short speech: two in Arabic and one in English. The Ambassador spoke first, followed by the Minister, then the LC team (Wishyar Mohamed acted as chair, moderator and translator on the panel), and Kamil Jawad the Acting Director General of the Library also made a statement. Ambassador Bandioli-Osio concluded the session about the major recommendations of the panel, and then invited the team to the office of the Minister of Culture. Deeb then briefed the Minister on the team's findings and recommendations. That evening Ambassador Bandioli-Osio organized a big dinner at the "Hunting Club" in honor of the Library of Congress team, at which he also invited members of CPA, the military and the Italian delegation. 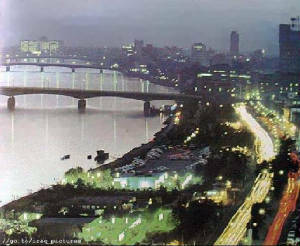 Baghdad at the Twilight of Evening, the eternal hope that each one will becoming more peaceful. To be changed later to possibly Iraqi pride, as well as change of address to one located in Baghdad and only concerned with this web site only. Here is an opportunity for you to send information on the people of Baghdad. Its various lifestyles, cultures, and much more. The reason why only this is being promoted is that America has over politicalized everything its get involved with, and for the people of Baghdad, very few people here in America knows who you really are. So now it is your opportunity for many others to get to know you as a peoples. Iraqis have expressed concern over the American perceptions, lables, and definitions applied to civil war and the up coming elections and its political campaign processes in the US. Iraqi anxiety mounts every day! The leading item of which is " WHO " has defined civil war? The American Political Process ? Or the American Media - Press ? There exist a central Iraqi character which rejects violence around personal religious beliefs, and thus the present state of concern and anxieties from informed Iraqis is understood. Bloglines - Blog on Baghdad Night Life ( NightLife ), RMC . Persian Gulf Veterans, and those service men and women who are now serving in this regions are encourage to join Persian Gulf Veterans here. Scroll down. Who are the " Heros " of Baghdad of today ? This is where you, the people of Baghdad, can post those in Iraq and Baghdad who are making a difference for your peoples. Private Contractors, and Volunteer Agencies involved. I am slowly establishing a cultural democracy network in which Moscow Night Life ( NightLife ), RMC [ http://euro-quest.tripod.com/moscownightlife ]is but on in whole series of websites to produce an Inter - City Cultural Communications website netwrok between selected International cities, and Ithaca, New York. This is Baghdad Night Life ( NightLife ), RMC website ( sub-domianed uder Tripod dot Com ).